Public festivals in Minorca have been celebrated for centuries and originated from San Juan Parties which take place in the Ciutadella from the XIV century. The day of John the Baptist, patron saint of the Ciutadella, is celebrated. They are unique and spectacular. For some days, the city becomes a place where more and more arrive to enjoy exiting and friendly parties, and where the locals offer their hospitality and traditional products from their land to visitors. During the festive days, the locals eat cold meat like sobrasada, carni, xua (a kind of sausage), cuixot and sweets such as ensaimada with chocolate. The typical drink for these days is the "gin amb llimonada", a mixture of Minorcan gin and lemon juice. All around the island except for the Ciutadella, this drink is known as “pomada”. The festivities are connected to the horse, seen as a heritage from the city's Arabic past. 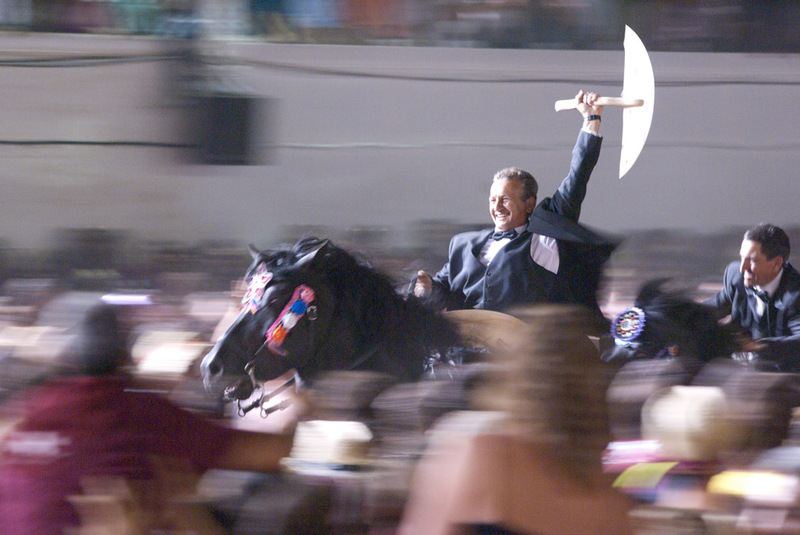 The central ceremony are the “jaleos” (or dance of the Minorcan horse) among the crowd. 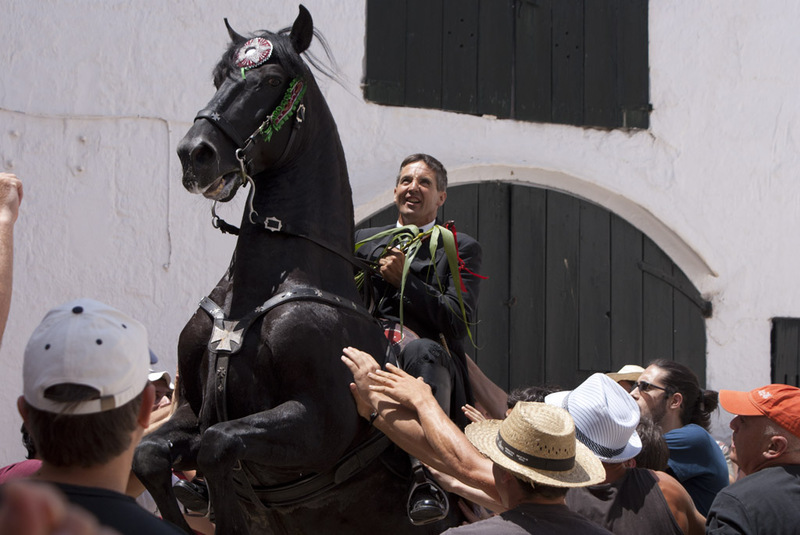 The riders lift their horses on their back legs while the locals and visitors (who actively participate during the ceremony) try to touch their chests. It is said that it is not only a question of ability from the rider but also nobleness from the animals, as one of their many qualities are its docility and obedience. 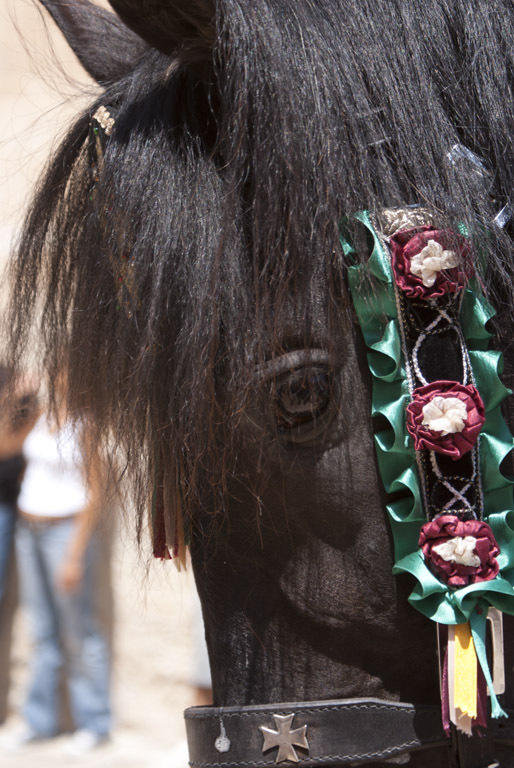 The native Minorcan horse is completely black and is dressed with golden ribbons and colourful carnations for the occasion. To match the look of the horse, their riders must always wear black and white.
. The four estates from the ancient Minorcan society are represented in the ceremony, called “Caixers”: the nobility, the church, the artisans and the peasants. These are chosen by the locals every two years. The celebrations start the Sunday before San Juan (día des “be” or day of the lamb) at 9 in the morning with the first flute melody opposite the “CaixerSenyor” palace (representing nobility). From there, the procession starts the route that will go through the Citadel will be accompanied by the “Homo des be” (man of the lamb) dressed with lambskin, crosses painted on his feet and arms, while carrying a live lamb on his back. He represents Saint John the Baptist. On June 23rd (San Juan's Eve) at 14:00 at “CaixerSenyor” palace, the “Flabioler” (flautist) requests permission to retrieve the knights and to let the party begin. By then the horses are already in the streets, and the “caragols” start, the horses walk around the old quarters of the Ciutadella while performing the "Jaleo” and surrounded by a crowd. One of the most important “caragols” on this occasion is the Caragol des Born. The war of the hazelnuts is also celebrated on this day, as well as the journey leading to San Juan Misa, where you can join the horses and their riders (caixers) on their way to San Juan chapel (8-10 km approx.) where they will perform a mass. On June 24th, the day of San Juan, the celebration starts at 8 am with the withdrawal of the guards who give way to the first "caragols". On this day, besides the official ceremonies, we can enjoy equestrian games known as the games of Pla. The festivity ends late at night, after the Caragol de Santa Clara and the last flute melody from the “CaixerSenyor” palace. It is recommended that visitors wear comfortable clothes and footwear to fully enjoy the day. *Pictures taken by Minorcan staff.